It's not difficult at all. Though, Scamp has already created some cliffy environments in the gold coast with the given set of rocks. My concern is that your cliffs should look similar. If you use different rocks that may not be the case anymore. We haven't been using these vanilla types of rocks and everyone knows and recognizes the shape of these rocks and they start to become really boring. We do have our own rocks, plenty of them, and as far as I can remember, we have them in all sizes. Maybe we can chat on IRC about what your problem is with our rocks, I'm sure I can help. Attempt #1 at the Anvil banner. Critiques very much welcome/appreciated at this stage. I don't see the need for the Imperial Dragon on there. The design stands out a bit too much and needs to be blended in a bit more, but I like it. Can you not have the thin banner symbol be squished? The aspect ratio should be maintained, otherwise I like this. Saint_Jiub wrote: OK, how 'bout this? I quite like the logo and the colours, good job S. Jiub. That way it stands out more when hung on Anvil's white walls. I did consider that, but ultimately decided against it because Anvil already has so much orange in its design now with its clay roofs. That, and the fact that Anvil is THE city of the Gold Coast and I wanted to touch on that, made me decide on gold for the color. We will need an Anvil version of our guard armor now with this new symbol. I imagine it would be a rather simple job, but I really can't say. I'm inclined to let Praedator take dibs if he wants to since he did the other ones (I can upload the high res PSD of the emblem if he wants it), otherwise I can claim that as well. Hmm? Prae didn't make that armor, Revenant did. Not heard from him in ages, neither here nor TR. Saint_Jiub wrote: I did consider that, but ultimately decided against it because Anvil already has so much orange in its design now with its clay roofs. That, and the fact that Anvil is THE city of the Gold Coast and I wanted to touch on that, made me decide on gold for the color. Shall I wait for a PC_Data update or insert them now SamirA? Probably best to wait, I don't know when Worsas is planning to update PC_Data, but I imagine these should make it in. If you want to use placeholders in the meantime feel free to use the Stirk banners or something. SamirA wrote: Hmm? Prae didn't make that armor, Revenant did. Not heard from him in ages, neither here nor TR. Woop, don't mind me then. Going crazy in my old age. I don't see any reason not to call that attempt final, looks really good. 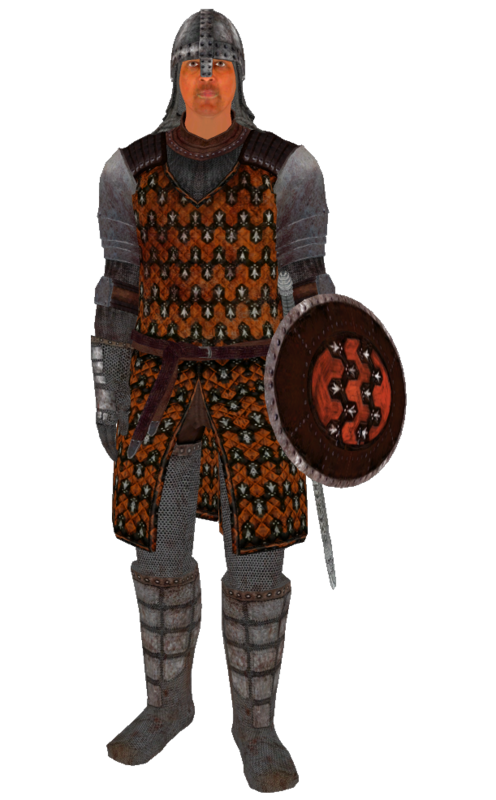 Delaying this release slightly to get the town guard armor fixed up. That means actual normal map for the helmet and matching pauldrons/greaves/boots for the set. I decided to leave the arms bare to make them a little more visually distinct from the standard Imperial Guards, if there's disagreement on this I can easily add sleeves though. Already looking forward to the day when those guards are seen among many other passengers in the streets of Anvil. Looks perfect. Good call on the sleeves.